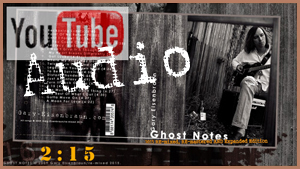 Gary Eisenbraun | Ghost Notes | "2:15". I found I was stranded. Lost at sea. You put me in exile by not thinking of me. I'm fading away. No one hears the words that I say. I never knew about being alone. just kicking the stones ...over you. I sit here and think while the world's closing in. So many better places that once I have been. I go far away. Never knew why you didn't stay. I built a bridge that leads to nowhere. I walk around while people just stare. I'm just wandering, how we got to here. Now that it's 2:15 and nothing's really clear. The world moves on, just to make it sting. I got nothing to give because I gave you everything. I'm falling down. It hurts when you're hitting the ground. You made your peace a long time ago. I'm seeing the moon and I'm hoping it glows. Next song: Too Much Of A Good Thing.